Pendle Coven aka Gaz Howell and Miles Whittaker, shorten their name to PCB for an excursion on the Meanwhile imprint with three tracks of dub-driven deep-house and techno. All the hallmarks of their cherished Modern Love cuts are in place, but given a crimson autumnal hue on 'Delay Offset' with splashy hi-hats and house-heavy bass to suit the Meanwhile aesthetic, before 'Wallflower' strips back to rigid Chicago jackers rhythms with a luxuriant coating of smoky night-time synthlines. 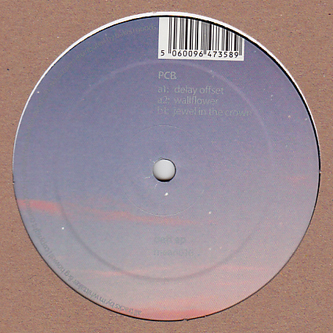 Over on the flip 'Jewel In The Crown' settles itself into a classic Pendle Coven Beat, with thickly insulated bass kicks guiding cavernous metallic dub chords and soul stirring Detroit-via-East Lancs chord changes that marks the best of their material. Plush.